All OC Express customers also receive a coupon good for $3 Fair Admission—that’s up to $8 off. So skip traffic and save on parking and admission with the OC Fair Express! 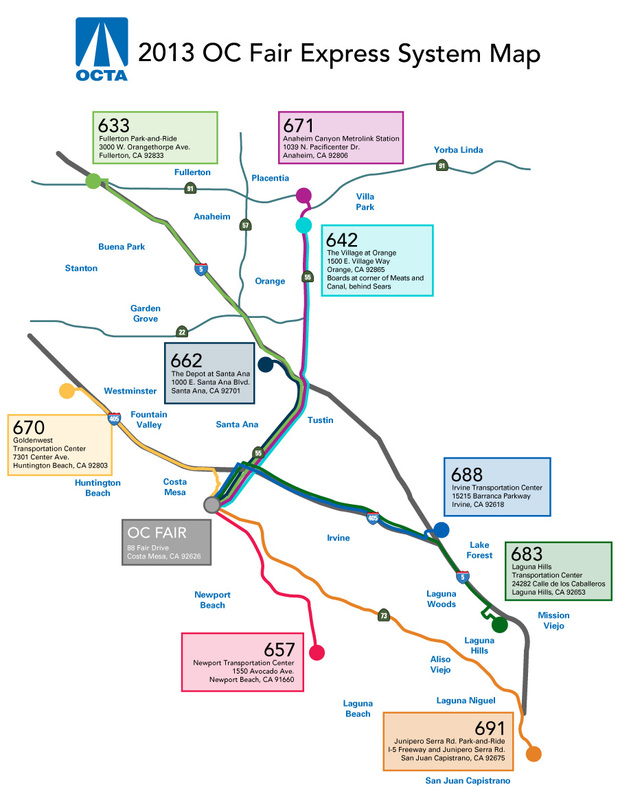 Take Metrolink to the Anaheim Canyon, Santa Ana or Irvine Metrolink Station and connect with OCTA’s OC Fair Express. Just show your valid Metrolink ticket for a FREE ride to the OC Fair. The non-stop bus will drop you off in front of the Fair’s yellow gate. Plus, all OC Fair Express passengers will receive a coupon good for $3 admission into the fair! Have exact fare ready. To speed things up, try to use dollar bills instead of coins. Remember the farebox does not make change. When traveling to the fair, you can purchase a round-trip bus pass for only $4. Then you simply swipe your pass in the farebox on your trip home from the fair. Always board through the front door. All OCTA buses are accessible to persons with disabilities. Arrive at your bus stop 10 minutes early. When leaving the fair, make sure you are at the bus stop 10 minutes before the last bus departs.